Our multidisciplinary team delivers unsurpassed care utilizing an array of techniques, including counseling, therapy and treatments by board-certified psychiatrists. Each day, we put people of all ages, backgrounds and ethnicities on the road to happier, healthier and more fulfilling lives. As specialists caring for adults, adolescents and children, the compassionate behavioral health professionals of the Debra Simon Center for Integrative Behavioral Health & Wellness know that “total body health” involves a complex, harmonious relationship between body AND mind. Our center embraces the bio-psychosocial-spiritual approach to integrative care. The strength of our Behavioral health team enables us to treat the whole person and to ensure individualized treatment plans. Our goal is to optimize each person’s strengths on their road to wellness. The Debra Simon Center of Integrative Behavioral Health & Wellness utilizes medications judiciously and always in combination with psychotherapy and integrative modalities. Offerings such as yoga, stress management, group therapy, nutritional counseling, and exercise opportunities are included in our plans of care. For information on outpatient services call at the Debra Simon Center for Integrative Behavioral Health and Wellness call 551-996-4450. Our Inpatient Psychiatric unit provides acute comprehensive hospital treatment for adult to geriatric patients who are unable to remain at home or in the community. We also provide care to our Medical-surgical psychiatric patient population. Each patient will be assessed for appropriateness to our unit based upon the needs of the patient and services provided by our interdisciplinary staff of behavioral health experts. The purpose of our 24 bed voluntary medical surgical psychiatric unit is to provide intensive, caring treatment of patients who cannot receive such treatment in the community or at home, owing to the severity of their psychiatric illness. The goal is always to maximize healthy responses and return the patient to their home setting in the community, as quickly as possible. Guidelines, structure and many opportunities for therapeutic exploration of critical issues are made available, with the patient’s family/significant others, as well as the expert administration and close monitoring of medication administration. Hospitalization, however, is viewed as only one link in the chain of services available to patients and their families at Hackensack University Medical Center. Patients may enter the system via a variety of means – through the Emergency Department, the Consultation Liaison Service, our Outpatient Division, attending physician’s office or other hospitals. Once in the system, patients and their families may access a spectrum of services, specifically tailored to meet their individualized needs. The medical, nursing, social work, activities staff and assistive personnel practice in a true interdisciplinary manner in order to best meet the needs of each patient. Linkages are forged with key departments to result in a successful outcome for patients and families alike and to assure a continuum of care. We were recognized as the second care facility in the country to achieve a Joint Commission Certification in Depression and as such, are a nationally recognized center of excellence in the care of depressed patients. For information on inpatient services call 551-996-2446. Dr. Magdalena Spariosu is Interim Chair of the Department of Psychiatry and Behavioral Medicine. 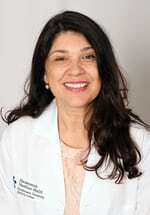 She is board certified in Psychiatry, Psychosomatic Medicine and Brain Injury Medicine. The Institute for Child Development offers comprehensive evaluation and treatment for children and adolescents who have problems with growth, development, and behavior. Choosing a PCP and forming a physician-patient relationship is an invaluable asset to your health and wellness. We can be reached by both bus and rail, with service from areas within Bergen County, as well as New York City. The Institute for Child Development (ICD) has gained a national and international reputation for providing superior diagnostic and treatment services to children with special needs.